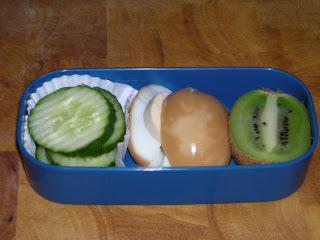 Time for some different stuff..
Upper tier: Crinkle cut (using my new mandolin) cucumber, a 'soy infused' egg and half a kiwi. 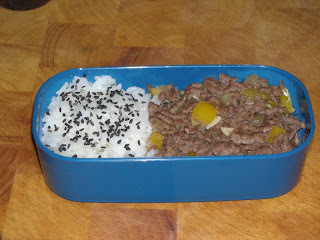 Lower tier: Boiled rice sprinkled with 'marimya' gomashio bin and fried mince. The fried mince is basically a dry "Bolognese" with chopped onion, chopped pepper and thinly sliced garlic. Fry that together and season with soy sauce and whatever takes your fancy. Since it's quite dry it doesn't make the rice soggy in the Bento box.